Large Group Speech usually begins in October or November and ends in February. Rehearsals are usually held in the evenings beginning at 6:00 p.m. andending around 10:00 p.m. Students need only attend rehearsals for their specific events. District contests are generally held on a Saturday in late January. State contest is generally held on a Saturday in early to mid-February. Individual Speech usually starts up at the beginning of 2nd semester (January). State speech is dependent upon receiving a "I" rating at Districts. If a student advances to State speech, State is generally held in early to mid-March. On Saturday, February 3rd, 11 groups comprised of 35 Gehlen Catholic High School students participated in the Iowa High School Speech Association’s (IHSSA) District State Group Speech Contest, held at Le Mars Community High School. One Act Play, “Wedding Downpour” - Claire Zubrod, Tyler Zenk, Alton, Katelyn Langel, Krista Lipp, Kayla Mayer, Malayna Hanks, Kathryn Ripley, Meredith Kellen, Aubree Nilles, Kaitlyn Willet & Melinda Zubrod. Musical Theatre, “Little Women” - Kathryn Ripley & Kaleigh Ripley. Varsity Reader’s Theatre, “Facebook Ruins Everything” - Sebastian Buman, Katelyn Norfolk, Carter Sitzmann, Sydney Logan, Ally Aquino, Madeline Begnoche, Malayna Hanks & Grace Kreber. Group 1 - Claire & Melinda Zubrod & Katelyn Langel. Group 3 - Rachel Langel, Morgan Murphy & Patricia Sitzmann. “Loons” - Katelyn Norfolk & Sebastian Buman. “Keeping Place” - Kayla Mayer, Krista Lipp & Grace Kreber. “The Door” - Carter Sitzmann, Jordan Larson & Elliotte Herbst. Freshman Reader’s Theatre, “Note to Self”- Nathan Nemmers, Landon Nilles, Traegen Kramer, Chloe Otto, Lexi Niichel, Jaime Hunt, Emily Klein, Lillian Harpenau, Patricia Sitzmann, Rachel Langel & Morgan Murphy. The group receiving a division “II” rating was the Group Improv of Aubree Nilles & Brooklyn Heissel. The Door” - Carter Sitzmann, Jordan Larson & Elliotte Herbst. “To have groups perform or even nominated is truly the icing on the cake!” exclaimed Mr. Morehead. Mr. Morehead share the students nominated for the All State Festival are very excited & look forward to attending the event. Both Mr. Morehead & the students feel it is a great accomplishment to be chosen for the All State Festival. The All State Large Group it is a great accomplishment to be chosen for the festival. 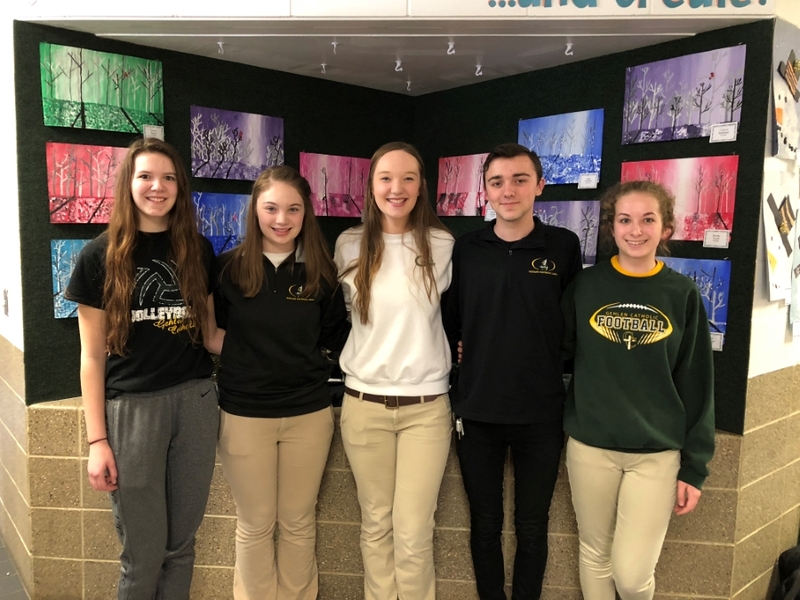 On Saturday, March 10th, Gehlen Catholic’s High School Speech team competed at the Iowa High School Speech Association’s State Individual Speech Contest. The contest was held at Kuemper Catholic School in Carroll. 5 Gehlen Catholic high school students competed in 5 events. Senior, Carter Sitzmann (LeMars) – Musical Theatre – straight “I’s” rating. Freshman, Chloe Otto (Hospers) – Acting. Gehlen Catholic High School Speech & Drama Moderator, Mr. Mark Morehead (Merrill), noted all of the speech students showed growth in their own self & confidence. He added, “State Individual Speech Contest will make them all better students & communicators.” Mr. Morehead knows Carter & Kathryn’s experiences in high school speech & drama will be of tremendous benefit during their involvement in their respective college theatre departments. He & the students thanked the Gehlen Catholic Fine Arts Boosters for their support this year.